One of the many unique things about NuView IRA is our passion for serving others – which also happens to be one of our four core values. We believe that each NuView employee embodies these values and as such, portrays it on a regular basis. We are constantly looking for ways to give back – as a company and in our separate lives. One of our favorite charities is Chair the Love – a 501(c)3 whose mission is to provide wheelchairs and mobility related items and services to those in need locally and abroad. NuView has supported the Wheelchair Foundation through Chair the Love for several years – holding events and making regular donations. Through this charity, we have been able to deliver multiple containers of wheelchairs to those who would otherwise never have mobility. In September we hosted our annual charity dinner to raise funds to continue to provide these gifts of mobility. One of the guest speakers at this dinner was Nathan Ogden, author of Unfrozen. Nathan spoke of his injuries that led to him being a quadriplegic, and his struggle with coming to terms with it. He talked about how he struggled to find his purpose and challenged us all to do the same. He also spoke of the reasons, or excuses, why we are not fulfilling our purpose. What do we say to ourselves that prevents us from doing what we are meant to do? We all have them, but when it comes down to it, if it is what we really want to do, we will find a way. Nathan’s biggest excuse is that he’s a quadriplegic, yet that’s never deterred him from living his life to the fullest. This really resonated with me personally. It kept me awake that night, as I asked myself, “What is my purpose?” Yes, I know I am a mother, a wife, a daughter, a sister and I have a great career, but I also know there’s more. What I realized, is that I have always had a servant heart. Serving others is what my purpose is, I’ve always known this. I’ve been making excuses for why I don’t volunteer anymore – I’m too tired, I don’t have enough time, and so on and so forth. The next day I made a decision that has already changed my life. I picked up the phone and called Sleep in Heavenly Peace (SHP). This charity was brought to my attention by a co-worker a few months earlier, but I thought I didn’t have time and put it on my list of “things to do some day”. Fortunately, a chapter of SHP had just started a few weeks earlier and they needed volunteers. I jumped in without hesitation! Sleep in Heavenly Peace was started in Idaho to give children that are sleeping on floors, couches and in a bed with their entire family, a bed of their very own. While there are many charities out there that provide the necessities of food, shelter and clothing to children, there are very few that provide the “luxury” of a bed. 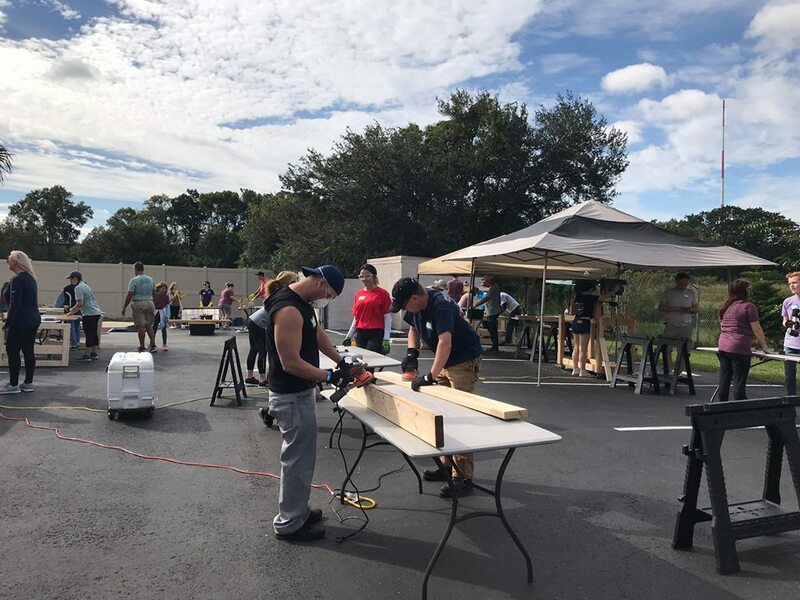 On Saturday, October 27th, NuView IRA sponsored the inaugural bed build for the West Orlando Chapter of Sleep in Heavenly Peace. What we thought was going to be 25 volunteers building ten beds in four hours, turned into 50 volunteers building 24 beds in three hours! Because of one build we will be able to give 24 children a safe place of their very own to sleep. I must say that finding my purpose has changed my life, and in that, is changing the lives of many others. I will be working with NuView to start a new chapter of Sleep in Heavenly Peace during the first quarter of next year, so we can continue the incredible work that has been started. Thank you to NuView and its employees for donating your time to making this bed build so successful. Now all we have to do is deliver beds! If you have any questions regarding Sleep in Heavenly Peace or would like to help in making sure “No kid sleeps on the floor in our town” feel free to contact me.